Learn highly-effective, non-invasive and leading-edge methods for saving lives. User friendly. Manual only. Learn how to stop a heart attack with your hands! Plus, learn how to stop external or internal bleeding without the aid of a compress. This thirty-seven page E.M.T. Manual offers vital information on TKM® procedures/techniques to use during the critical moments of emergency episodes. Included are common family / household uses. Instructions for these easy-to-use emergency procedures are accompanied by easy-to-follow illustrations. 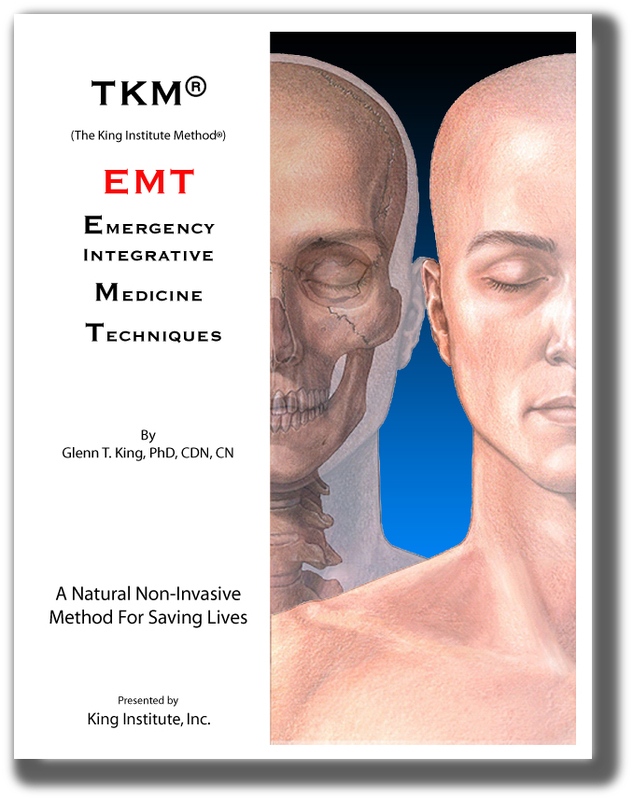 To learn more about the TKM®: Emergency Integrative Medicine Techniques (EMT) course, recommended for families, all businesses and organizations, just visit the Education page. © 2002, 2007 Glenn T. King, PhD, CDN, CN, All Rights Reserved.